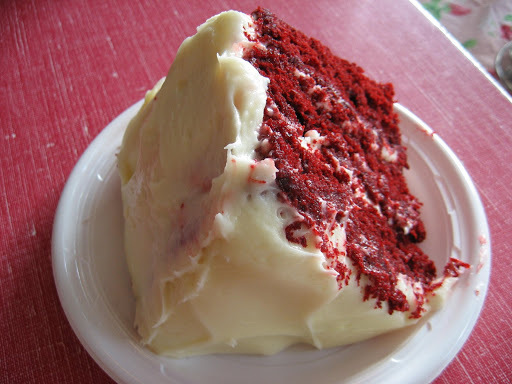 This is sort of embarrassing to admit, but here goes—Jessica Simpson introduced me to Red Velvet Cake. She also introduced me to the importance of keeping marriage and reality television separate, but that’s neither here nor there. On an InStyle television special to promote Newlyweds and her book I Do: Achieving Your Dream Wedding (ha! ), she revealed that the top tier of her wedding cake was Red Velvet (her favorite southern treat). If I remember correctly, that was sometime in 2003 and ever since then, I’ve been eager to sample a slice. Which brings us to now—four years later and my desire to try Red Velvet is still intact; I wish I could say the same about the marriage between Simpson and Lachey. After reading an article in early February by Florence Fabricant in the New York Times titled “So Naughty, So Nice” about the Red Velvet boom in New York City, I knew a bakery whipping up an excellent Red Velvet had to be included on the food tour. After our second lunch at the Shake Shack, The Astronomer and I walked across town to Billy’s Bakery. According to Fabricant, a majority of tasters for her article enjoyed Billy’s rendition of Red Velvet. With half a Luger Burger and an entire concrete in my belly, I was hoping to get a Red Velvet cupcake, but sadly they were fresh out. My only choice was to order an entire slice, which The Astronomer estimated was at least five inches tall and weighed close to a pound. 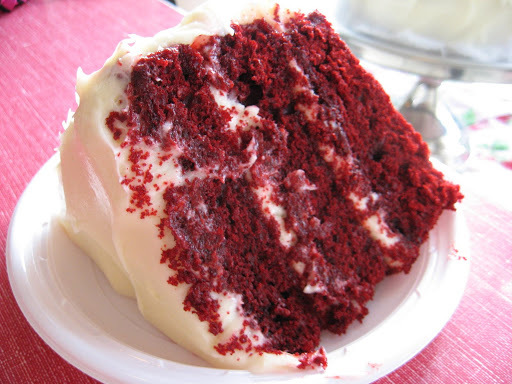 Aesthetically speaking, the Red Velvet cake is a real beauty. 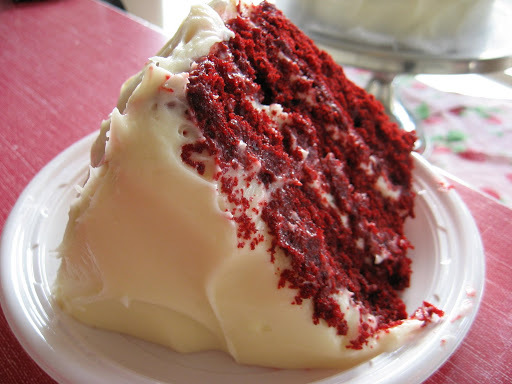 Three layers of deep red cake are iced with thick cream cheese frosting. The intense color contrast between the red and white is truly mesmerizing to behold. The Red Velvet’s taste is enjoyable, but not as compelling as its appearance. The cake is very moist, if somewhat flavorless. While the batter contains cocoa powder, the cake is not exactly chocolaty. The cake’s gorgeous red color takes center stage, which is fine by me because I adore rich tones. The cream cheese frosting is ridiculously decadent and makes up for the flavor and sweetness lacking in the cake. The frosting is piled on generously, so palate fatigue is inevitable. The Astronomer and I each had a few bites and had the rest packed up to-go. I finally finished the cake after two more sittings over the next two days. IT’S a cake that can stop traffic. The layers are an improbable red that can vary from a fluorescent pink to a dark ruddy mahogany. The color, often enhanced by buckets of food coloring, becomes even more eye-catching set against clouds of snowy icing, like a slash of glossy lipstick framed by platinum blond curls. Even the name has a vampy allure: red velvet. ”It’s the Dolly Parton of cakes: a little bit tacky, but you love her,” said Angie Mosier, a food writer in Atlanta and a board member of the Southern Foodways Alliance at the University of Mississippi in Oxford. But no matter how you slice it — or bake it — red velvet cake is suddenly all the rage. Every new bakery seems to sell a version. Established ones are adding the cake to their repertory, and those that have always made it are hard pressed to keep up with the demand. In New York City, more than 20 bakeries now sell red velvet cake or cupcakes, threatening to end the long reign of the city’s traditional favorites, cheese cake and dark chocolate blackout. ”Red velvet is beautiful and fun,” said Amy Scherber, the owner of Amy’s Bread. ”I started making it five or six years ago, and at that time you couldn’t get it in many places besides Magnolia. Now it’s very popular.” Magnolia, the Greenwich Village bakery, specializes in Southern baked goods, and red velvet has been its most popular cake from the day it opened about 10 years ago. Since then, Magnolia has inspired a variety of spinoffs and imitators, and they all do a heavy traffic in red velvet. Some bakers and food historians attribute the cake’s rise in popularity to its role in the 1989 film ”Steel Magnolias,” where it appeared in the shape of an armadillo, with gray icing. The cake, if not the armadillo, had staying power. But is this American oddity more than just a pretty face? To find out, the Dining section recently conducted a tasting of red velvet cakes that were either baked in New York City or are available by mail order. Many were disappointingly bland, but two won unanimous approval. The best were moist and tender, not too sweet, like yellow cake with an extra wink of flavor. The layers were in harmony with an alluringly rich fluff of soft cream-cheese or butter-cream icing, not a gummy or sugary plaster. The winning cakes and cupcakes did not taste strongly of chocolate, an essential ingredient, some say, in the classic version of the cake. But cocoa had a noticeable presence in them. Though the consensus is that red velvet, like many layer cakes, is from the South, it is certainly not in every cookbook about Southern food. No definitive information exists on exactly where it came from, how it should be made or why it is red. 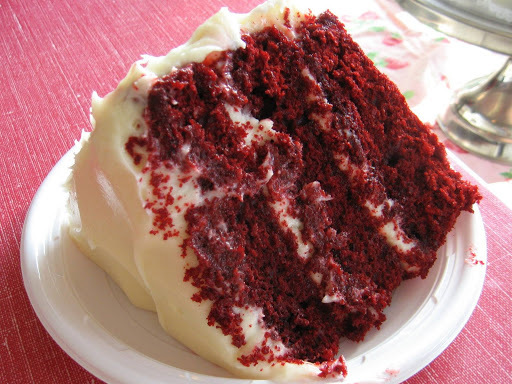 In fact, red velvet cake has produced almost as many theories and controversies as recipes. Mr. Doherty, the Waldorf’s executive chef, said the hotel still gets many requests for red velvet, so it is offered on the room service menu and in Oscar’s American Brasserie. ”It’s not my favorite cake,” he said. ”I can’t bear the thought of all that food coloring.” He uses beets in his version. Some other chefs, including Adam Perry Lang of Daisy May’s BBQ USA, are also as unlikely to pour food coloring into a batter as to put maraschino cherries on a baked ham. Mr. Lang worked on his recipe with Johnny Iuzzini, the pastry chef at Jean Georges, and came up with a cake that was rated one of the best in the Dining section’s blind tasting. He also uses beets, but with redder results than Mr. Doherty. Carl S. Redding, who serves red velvet cake at Amy Ruth’s, his restaurant in Harlem, said that many places do not make it properly. ”There are people who just dump red food coloring into a yellow cake batter, but it has to have cocoa,” he said. Craig Claiborne, a Mississippi native who was a food editor and restaurant critic for The New York Times, included a red velvet recipe with no cocoa in ”Craig Claiborne’s Southern Cooking” (Times Books, 1987). But to most authorities, some cocoa is essential. In cakes, an acid like buttermilk or vinegar may be used to activate baking soda, a common leavening. The reddish tint produced by the acid and the cocoa might explain why some chocolate cakes are called devil’s food, a theory that was held by James Beard. Home bakers in the South may have decided to exaggerate cocoa’s natural hue with food coloring and — Eureka! — they had red velvet. Most recipes for red velvet cake call for cocoa in amounts ranging from an insignificant teaspoon to a serious half-cup, like the one by Elisa Strauss, who bakes cakes to order on the Upper West Side and whose ”Confetti Cakes Cookbook” is to be published this spring by Little, Brown. The more cocoa in the cake, the more red food coloring is needed to override the brown. But home bakers should be aware that using a lot of red food coloring, as in the unapologetic amount in the recipe given here, carries the risk of thoroughly spattering the kitchen. And there is a limit to how much cocoa can be used effectively. DAISY MAY’S BBQ USA — 623 11th Avenue (46th Street), (212) 977-1500. Simple, moist, dark red cupcakes with a hint of chocolate and icing that was not too sweet; $4 each. MAKE MY CAKE — 121A St. Nicholas Avenue (116th Street), (212) 932-0833; 2380 Adam Clayton Powell Boulevard (139th Street), (212) 234-2344. Dark red two-layer cake with decided chocolate overtones and a straightforward cream cheese icing, perhaps a classic. Slices $4. Whole cakes are available in six round or four square sizes ($40 to $255). Cupcakes are $2.75. BETTY BAKERY — 448 Atlantic Avenue (Nevins Street), Boerum Hill, Brooklyn, (718) 237-2271. Deep red three-layer cake was not too sweet, with a touch of chocolate and rich icing that one taster found a little gritty. Slices $3.75; whole cakes are available in three sizes, from four inches ($12) to eight inches ($24); cupcakes $2.25. Larger cakes can also be ordered. 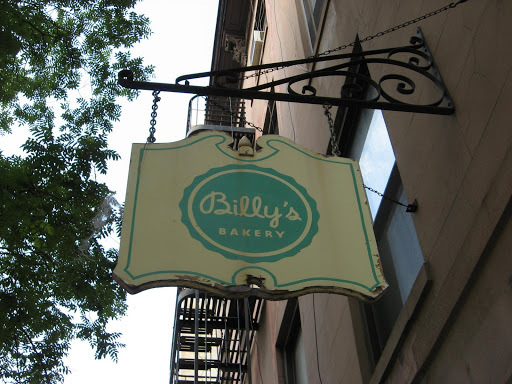 BILLY’S BAKERY — 184 Ninth Avenue (21st Street), (212) 647-9956. Some tasters thought the three bright-red cake layers were bland, but all agreed that the butter cream was very good. Slices $4,50; whole nine-inch cake $44; cupcakes $2.25. MAGNOLIA BAKERY — 401 Bleecker Street (West 11th Street), (212) 462-2572. Stunning red cake with tender texture, a fleeting cocoa flavor and bright white icing. Slices $4.25; whole three-layer cakes are available in two sizes, six inches ($25) and nine inches ($45); cupcakes $2.50. Not included in the blind tasting but well liked was the cake from WILLIAMS-SONOMA ($65 from 800-541-2233 or williams-sonoma.com), which also sells excellent red velvet cupcake mix ($14) in its stores. 2 1/2 teaspoons white vinegar. Preheat oven to 350 degrees. Place teaspoon of butter in each of 3 round 9-inch layer cake pans and place pans in oven for a few minutes until butter melts. Remove pans from oven, brush interior bottom and sides of each with butter and line bottoms with parchment. Place oil and sugar in bowl of an electric mixer and beat at medium speed until well-blended. Beat in eggs one at a time. With machine on low, very slowly add red food coloring. (Take care: it may splash.) Add vanilla. Add flour mixture alternately with buttermilk in two batches. Scrape down bowl and beat just long enough to combine. Divide batter among pans, place in oven and bake until a cake tester comes out clean, 40 to 45 minutes. Let cool in pans 20 minutes. Then remove from pans, flip layers over and peel off parchment. Cool completely before frosting. 1 1/2 cups confectioners’ sugar, sifted. Softly whip cream by hand, in electric mixer or in food processor. Cover in bowl and refrigerate. Blend cream cheese and mascarpone in food processor or electric mixer until smooth. Add vanilla, pulse briefly, and add confectioners’ sugar. Blend well. Transfer cream cheese mixture to bowl; fold in whipped cream. Refrigerate until needed. Correction: February 21, 2007, Wednesday An article last Wednesday about red velvet cake referred incorrectly to a recipe for the cake in ”Craig Claiborne’s Southern Cooking” (Times Books, 1987). The recipe contained cocoa, it was not cocoa-free. I just saw your tastespotting post about this cake. The first thing I thought was Jessica Simpson. I’m a fan of hers even if everything thinks she’s annoying and can’t hold a marriage together. Now I’ve gotta try that cake. It looks amazing! We had these for Thanksgiving, family reunions, and other holidays. I have an aunt that will probably have the image of red velvet cake engraved on her tombstone, she’s so famous for it. The cake part is disappointing if not done right, but that one looks like a winner. You really want a layer cake and not a cupcake, as the real deal gives you more icing. omg i love red velvet either in cake or cupcake form. that one looks so good. i wish i could have a piece of it myself. In Philly you should try Brown Betty Dessert Boutique in Northern Liberties. They make a red velvet cupcake that is dense and chocolately with a thick layer of cream cheese frosting on top. cathy, i desperately want to see the alinea review! I’m with you man, I don’t see the hype in the red and white. If anything it tastes like an American flag that’s missing something…oh yes…the stars of good taste! haha, I think I was introduced to red velvet cake by Torrie Spelling. I was surfing channels and saw her baking red velvet cupcakes for a party. I loved the color. I have yet to try the cake though. I think if I do make this I would make it in cupcake form. If you are ever in Los Angeles, there is a very old fashion styled bakery called SusieCakes. They have the best Red Velvet cake I have ever tasted. Very moist with creamy cream cheese frosting.